If you love stats, you’re going to enjoy our new weekly feature! Every Wednesday we’ll be releasing a new must-know marketing statistic to help you make smarter decisions (and show off your marketing savvy). Marketing automation is often mistaken as a glorified email program… wrong (want to know more about how automation and ESP’s differ? check out ESP VS Automation. ! Automation is a tool to capture, convert and court leads. 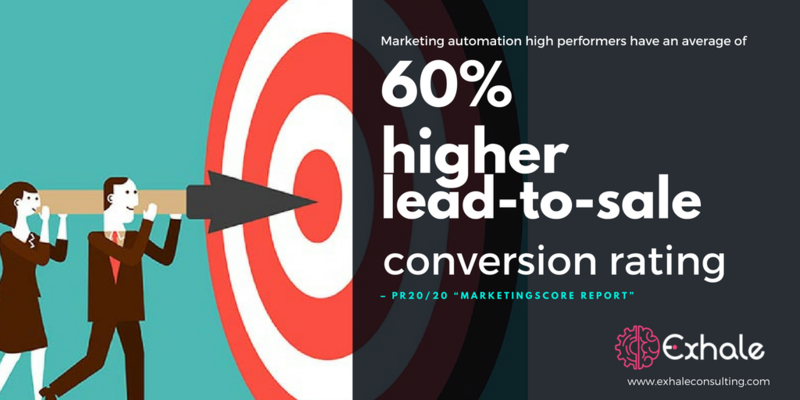 In fact, as shown above, marketers who implement automation as an engine for their efforts are proven to not only generate more leads, but also have a 60% higher lead-to-sale conversion rating. That’s nothing to complain about! Curious how automation can work for you? Or the types of results you can expect? Let’s connect and set-up a discovery call.